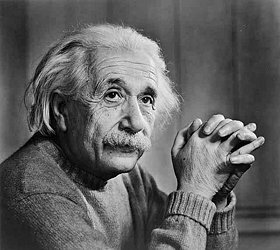 Albert Einstein is widely recognized by history as “the father of modern physics.” Even as a boy, Einstein saw the entire world differently — with a unique zeal, curiosity, and childlike imagination and enthusiasm that carried him throughout his life. He was inspired by new ideas, by asking questions and finding the answers — of accepting all of life’s mysteries and questing to explore, uncover, and reveal them. Last March, I wrote a post about the 3 Truths as described in Daniel Millman’s book Way of the Peaceful Warrior. They are the rules to live all life by…Humor, Paradox, and Change. Living in this kind of truth consistently requires the almost immeasurable courage of a great warrior and the innocent fearlessness of a child. In and of itself, this is a paradox. How much do you follow your imagination and intuition? How often do you let it shape your reality? Do you have the courage to fail, to focus in on and live in the moment? To thirst and hunger for knowledge and experience? Do you work and love with equal and balanced passion? These are just some small rules to live by, rules of a life successfully lived in my opinion, and rules that happen to inspire and thrill me. There is a little bit of madness in all success, a need to seek out and solve problems and the internal spark and thrill of competing against others and in the process bettering oneself are qualities that exist preternaturally in all individuals who take on any grand feat, task, or challenge. Coupled with the wherewithal to keep going forward when only you know the road and the only one willing to travel it. It takes a certain kind of individual — one that embraces all that life brings to them — constantly seeking answers, challenging oneself and others — all to change the world in their own special way. Einstein might say that it takes a shred of madness, a certain kind of courage, a rich sense of humor and a spirited sense of adventure. It’s a special kind of genius. ~ by Dan Fabrizio on June 7, 2012.